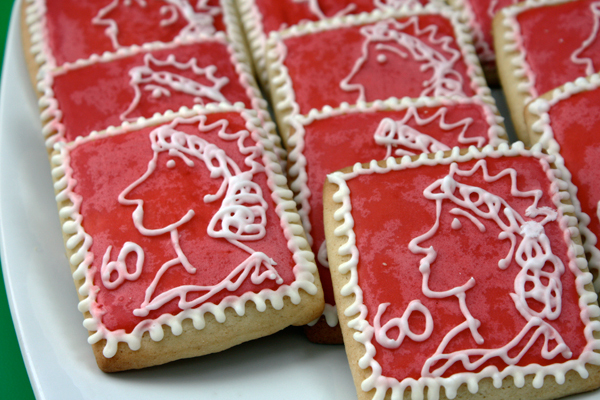 Last weekend, the Queen celebrated her Diamond Jubilee, meaning she’s had 60 years on the throne. The entire weekend was filled with festivities – including a pageant on the Thames that had over 1,000 boats parading down the river, and a concert in front of Buckingham Palace. To also mark the occasion, everyone in the UK received two days off, giving us a four-day weekend to celebrate – or in my case, bake. A bunch of the girls from where I work are running the the Race for Life 5K – it’s an event that occurs in different places throughout the country to raise money for Cancer Research UK. To help with the fundraising, I take my baking into work each week and people donate their spare change in exchange for a treat. 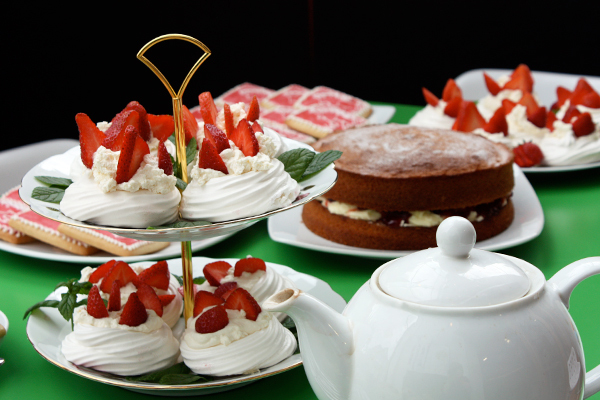 But for the Jubilee, we decided to to an Afternoon Tea as a more direct fundraiser. 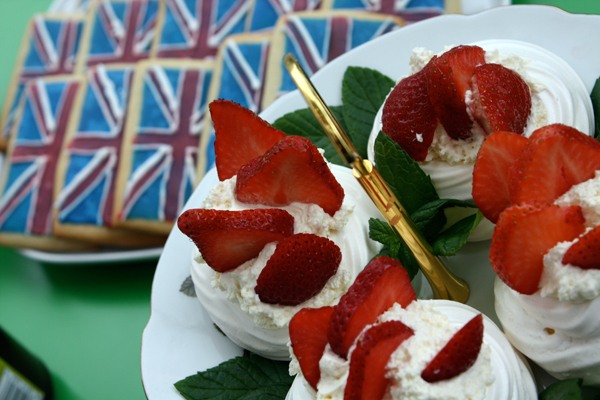 I made my Iced Sugar Cookies, decorated like Union flags and postage stamps, as well as some meringues with whipped cream and strawberries (an homage to a popular British dessert, Eton mess). Lindsay made some wonderful scones served with fresh jam and clotted cream, which just melted on your tongue. Claire made a classic Victoria sponge (or Elizabeth sponge for this occasion) – which is a type of yellow cake with jam and buttercream frosting between the two layers. 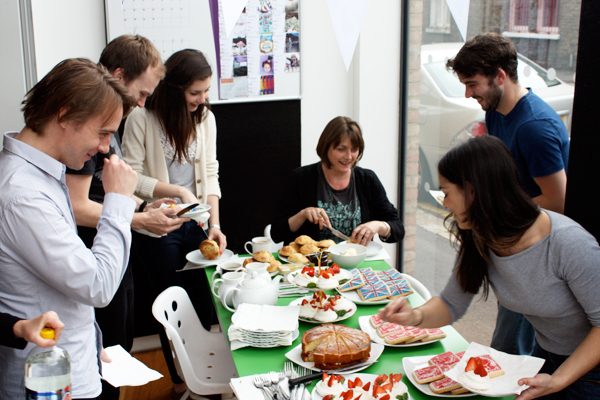 And of course, we had a fresh pot of tea and lemonade to go with all of the sweets. 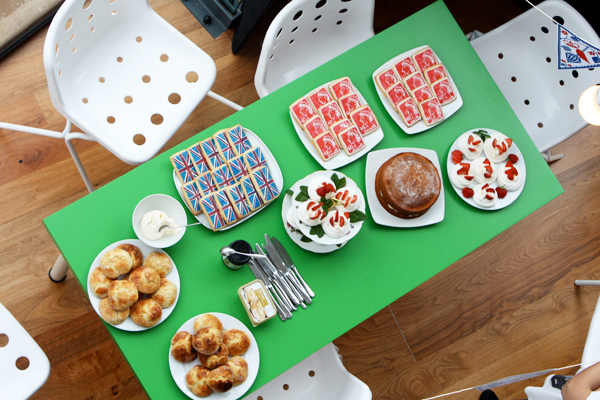 Everything was absolutely delicious and everyone at work enjoyed the break to pay our own little tribute to the Queen, and talk about the Jubilee events. We also raised quite a bit towards our £1,000 goal for Race for Life. If you’d like to donate as well, please sponsor our team at our Race for Life page.